In the summer of 1910, a devastating series of forest fires swept over Idaho, Montana, and Washington, culminating on August 20–21 in what is known as the "Big Blowup." Coming only five years after the U.S. Forest Service’s establishment, this seminal event made a deep and lasting impact on the agency. Three future Forest Service chiefs were directly involved in the Big Blowup, as were several other men who would exert influence over the agency’s fire protection policy following the fire. It pushed forest fire issues into the public discourse, and led to new fire prevention and suppression policies, policies that still influence fire management around the world today. Burned timber on Rainey Creek in Lolo National Forest, Montana following 1910 fires. The first fire of the 1910 season broke out on the Blackfeet National Forest in northwestern Montana on April 29. Though District (now Region) One Forester William Greeley expressed optimism about the Forest Service’s ability to cope with the coming fire season, the young agency was undermanned, underfunded, and under-prepared for what was to come. Fires continued throughout the ensuing summer months (in fact, fires throughout the West plagued the agency), and the agency scrambled to combat them. By August, the region was experiencing drought conditions. Clarence B. Swim of the Forest Service recalled: "The late summer of 1910 approached with ominous, sinister, and threatening portents. 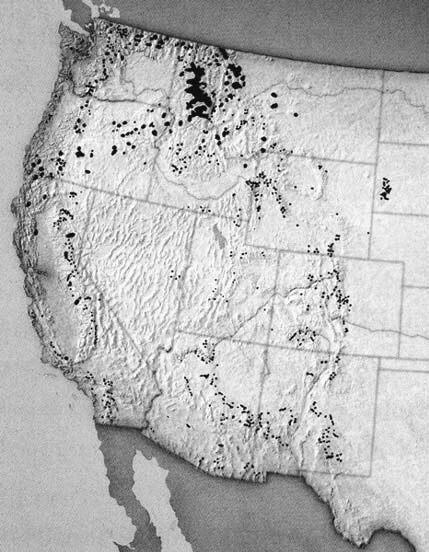 Dire catastrophe seemed to permeate the very atmosphere..."
Map of 1910 fires in the national forests of the western U.S. Does not show fires on state, private, or other federal lands, which could triple total area. Blackfeet, and Kaniksu National Forests. With supplies and manpower lacking and the number of fires was growing, the Forest Service persuaded President William Howard Taft to deploy troops to supplement the civilian firefighting force. In all, around 4,000 soldiers would be called into action. With fires popping up in the Idaho panhandle and western Montana as well as in Washington and Oregon, the federal government’s resources were stretched to the breaking point. By the end of the week, however, firefighters appeared to have the upper hand. Supervisors began releasing employees on August 19. On August 20 hurricane-force winds swept through the region and fanned embers and low flames back to life all across the Northern Rockies. There was no stopping or containing the fire; one could only hope to avoid it. Trains raced to evacuate towns just ahead of the flames. Forester Edward G. Stahl recalled that flames hundreds of feet high were "fanned by a tornadic wind so violent that the flames flattened out ahead, swooping to earth in great darting curves, truly a veritable red demon from hell." In the same instant that towns and timber alike perished, heroes were made, legends were born, and history changed forever. Of all the dramatic tales of survival, none has captured the popular imagination more than that of Ed Pulaski. Fighting a fire about ten miles southwest of Wallace, Idaho, Ranger Pulaski order his crew of forty-three men to follow him to a mineshaft to escape the inferno. They barely outran the fire. Pulaski ordered his men to lie down on the tunnel floor while he hung blankets over the entrance, threatening to shoot any man who tried to flee. He threw water onto the blankets until the smoke overwhelmed him. When the men awoke the next day, all but five had survived. Pulaski’s decisive actions and his courage in the face of death made for great copy. But it was his simple desire to get home to his wife and daughter in Wallace that struck a universal cord with the public and helped elevate him into Forest Service myth almost before the fires had stopped burning. It was not long before Pulaski became a hero—though he never comfortably wore that mantle—and his story legend. His legend was further cemented when he was credited with inventing the firefighting tool that bears his name. He received no compensation for either his wounds or his invention. The only compensation came in 1923 when he won $500 in an essay contest for the account of his actions in the Big Blowup. Mouth of tunnel where Ranger Edward Pulaski sheltered his men during the Big Blowup, photo taken September 1910. Official reports after the Big Blowup estimated that 1,736 total fires burned more than 3 million acres of private and federal land and consumed an estimated 7.5 billion board feet of timber. At least 85 people were killed. Several small towns were completely destroyed, and one-third of Wallace was burned. Smoke from the fires reached New England and soot travelled all the way to Greenland. Nationally, wildfires in 1910 consumed more than 5 million acres. The Lake States region saw its worst fire season ever, with more than a million acres lost. The Forest Service moved quickly to assess the damage to the land as well as its reputation before the fires were even out. The agency’s fire suppression policy of extinguishing all fires as quickly as possible, which had seemed so successful during the difficult fire season of 1908, was called into question. Writing in a special issue of American Forestry (now American Forests and found below) in an effort to defend the agency’s policy and actions, several foresters described what had happened and the lessons they had drawn. Chief Henry Graves reiterated a call for an aggressive fire prevention policy as the best way to protect America’s private and public forests and the nation’s economic well-being. Ferdinand Silcox, head of the region’s quartermaster corps during the fire and later agency chief in the 1930s, argued that the best way to prevent such a disaster in the future was to apply enough science, technology, and manpower to the problem, arguing that fire should and could be eliminated from the landscape. In other publications and venues, others pointed to the agency’s actions during the fires as proof of its value and mission, and argued for an expansion of the Forest Service’s funding, research, and employee rolls to meet this mission. These and other subsequent literary efforts to defend the Forest Service’s reputation and mission may have contributed to distorting the history of the event. Most early accounts of the event (some written by agency personnel) minimized the critical role of the roughly 4,000 soldiers and others in fighting the fires, for example, even though they served admirably. Ninety years would pass before the Big Blowup was fully examined by a historian and placed in the broader context of fire and Forest Service history. Contemporary critics, however, pointed out the flaws in the fire suppression policy. Elers Koch, a forester who had fought the Big Blowup on the Lolo National Forest in Montana, argued afterward in favor of letting backcountry fires burn themselves out. Professor Herman Chapman of Yale Forest School, who was studying Southern forests, argued that fire had an important if little understood ecological role in the landscape. And Secretary of the Interior Richard Ballinger, whose department had seen part of the newly created Glacier National Park burn along with surrounding national forest land, argued for allowing annual burning to reduce fuel loads like the Native Americans did. But Forest Service leadership and forestry leaders like Gifford Pinchot thought otherwise and worked for years to suppress and discredit such arguments. In the aftermath of 1910, Chief Graves staked the agency’s continued existence on the belief that it could in fact defeat fire. Toward that end, Graves embraced a cooperative approach with state and private associations to fight fire (realized the next year through the Weeks Act) and soon launched a fire protection campaign that involved removing fire from the landscape and changing how Americans viewed fire. The campaign, which would lead to the creation of Smokey Bear, would last for more than half a century and completely change forest ecology throughout the country during its lifetime. Other nations adopted the American fire suppression model, with equally devastating results. Now the folly of fighting backcountry fires is widely accepted and the role of fire in maintaining forest health is understood. The impact of the campaign is the most important legacy of the 1910 Fires and the Big Blowup—and it is a legacy that we are still coping with today. View historic photographs documenting the aftermath of the fires in our 1910 Fires Image Gallery. 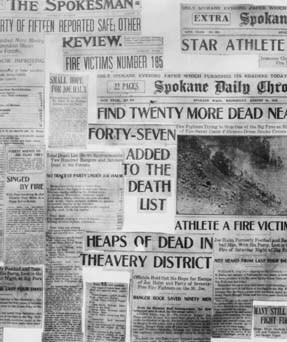 Newspaper clippings about the 1910 Fires from Montana, Idaho, and Washington. McKay, Kathryn L. Trails of the Past: Historical Overview of the Flathead National Forest, Montana, 1800-1960 (Chapter 9). USFS, 1994. An excerpt from the history of the Flathead National Forest examining the history of the 1910 fires. Pyne, Stephen J. America's Fires: A Historical Context for Policy and Practice. Forest History Society, 2010. Reviews the historical context of U.S. fire issues and policies, including the impacts of the 1910 fires. * From the special issue of American Forestry in 1910. 1910 Fire Commemoration Information Site. USFS Region One online exhibit. The Great 1910 Fire website. Flame and Ruin: The Fires of 1910, a special series from the Spokesman-Review. Stories: The 1910 Fire, from Evergreen Magazine, published by the Idaho Forest Products Association.